New to the world of uninterruptible power supply (UPS) systems? Consider this UPS buying guide your introduction to the basic concepts behind UPS Systems and which type will work best for your requirements. A UPS, at its most basic, is a battery backup power system that supplies power long enough for equipment to properly shut down when utility power fails. It helps prevent loss of data and minimizes the stress a hard shutdown causes on your electronic equipment. The UPS is also a surge protector that protects connected devices from power problems, like surges or abnormal voltages, which can damage, reduce lifespan, or affect performance of electronic equipment and devices. Why do I need a UPS System? In case of a blackout, the UPS switches immediately over to battery power to provide a continuous power source for the length of the battery. Battery life can vary by system and depends on how much power you use. The battery backup gives you time to power down sensitive equipment, servers, or even video game consoles without loss of data or progress. Different UPS systems also provide certain levels of protection for other power problems that arise. What types of UPS Systems are there? UPS systems have three different topologies, or categories, based on what type of power protection you need. The three topologies are Standby, Line-Interactive, and Double-Conversion. What types of power problems do I have? Many people are aware of only one type of power problem: a blackout. This is when the power goes out and stays out for a few seconds up to a few days. But, many more common power problems exist. What are common power problems? Below are definitions of common power problems. If you would like to learn more about power problems, please read our blog: Preventing Common Power Problems. Surge – A brief, but intense, spike in electricity commonly caused by lightning. Surges can damage and destroy electronics, and the intense “spike in electricity” or spike in voltage and current harms circuit boards and components. Blackout – A power outage lasting anywhere from seconds to days. These are most commonly caused by severe weather, utility power shortages, accidents, and power grid failures. Brownout – An intentional or unintentional drop in voltage for an extended period of time. In emergency conditions, power companies may lower the voltage of your electricity to reduce strained resources and avoid a total blackout. Voltage Sags – A sag is also a type of under voltage, but, unlike a brownout, it’s sudden and brief. Over Voltage – Occurs when incoming voltage is higher than normal and lasts longer than a surge but not high enough to be classified as a surge or spike. Frequency Noise – Also known as line noise, frequency noise can disrupt or degrade the performance of a circuit by injecting abnormalities into the system. Frequency Variation – Not a common problem when power supplies are stable, but it can occur when using generators and power frequency fluctuates more than desired. Harmonic Distortion – A departure from the ideal electrical signal on a given power source. Make a list of your most common power problems from the definitions above, and use the chart below to pick which topology solves your problems. How Big Does My UPS Need to Be? In order to make your UPS run properly, your UPS has to be large enough to support all of the equipment plugged into it. You will need to find the UPS capacity. 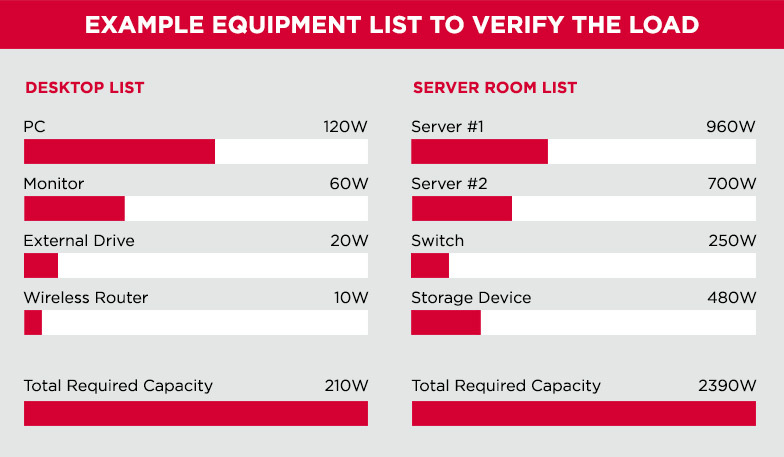 Capacity is how much power a UPS system can provide (measured in Watts). The higher the capacity, the more electronic equipment, and devices it can support. To find the UPS capacity, you will need to calculate the load. The Load is the combined amount of power each of the devices use. To identify the load, make an equipment list, including the total watts each piece of equipment requires to run properly. Include all of the devices the UPS will need to support. If a piece of equipment has a redundant power supply, only count the wattage of ONE power supply. If you are unsure how many watts your equipment requires, consult the manufacturer or power supply specifications in the user manual. Once you have calculated your load, count the number of power cords you want to connect to the UPS. Your UPS system will need to have enough outlets to cover the number of power cords. How much time do I want electricity once the power goes out? You have already decided your UPS’ topology and what size it needs to be. Now, you need to think about what you would like to do with the battery power when a power problem occurs. Would you like to focus on shutting down all of your connected devices safely? Do you want to keep your DVR and TV running during the power problem? Do you want to finish the section of the video game you are on or just save where you are at? You must now determine runtime. Runtime is the number of minutes a UPS system can support the attached devices with electricity during a blackout. The minimum runtime is the time you need to complete proper equipment shutdown. When shopping for runtime, you will be looking at the length of time the batteries in the UPS can support equipment through power outages when utility power is unavailable. Keep in mind the number of watts supported affects runtime: the smaller the wattage load connected, the longer the batteries will last. The larger the wattage load, the shorter the runtime will be. To determine runtime, we want to look for a range. Begin with the number of minutes it will take to perform complete device shutdown and then build an acceptable range of runtimes. The broader the range, the more UPS system choices you will have. Do I need sine wave output from my UPS? Utility power supplies electricity in the form of sine wave alternating current. When the UPS is in normal mode, it passes the same electrical sine wave to your connected devices. If the UPS switches to operate in battery mode, it either produces sine wave or simulated sine wave electricity to power your electronics. 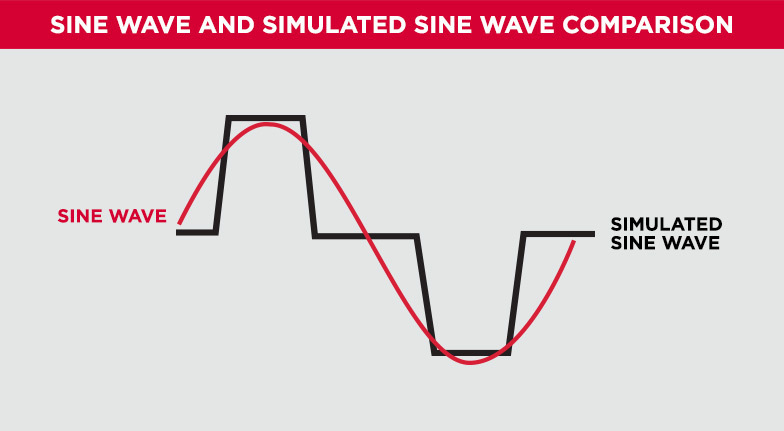 Here is an illustration of a sine wave and a simulated sine wave. You will notice the simulated sine wave output has a power gap at each cycle. Sometimes this power gap may cause stress in the power supply in sensitive electronics, harming them. Computers and Equipment that are Energy Star® or 80 PLUS® efficient systems using Active PFC power supplies. Electronic equipment with Active PFC power supplies may shut down unexpectedly when using a UPS with simulated sine wave output, resulting in data loss or equipment damage. 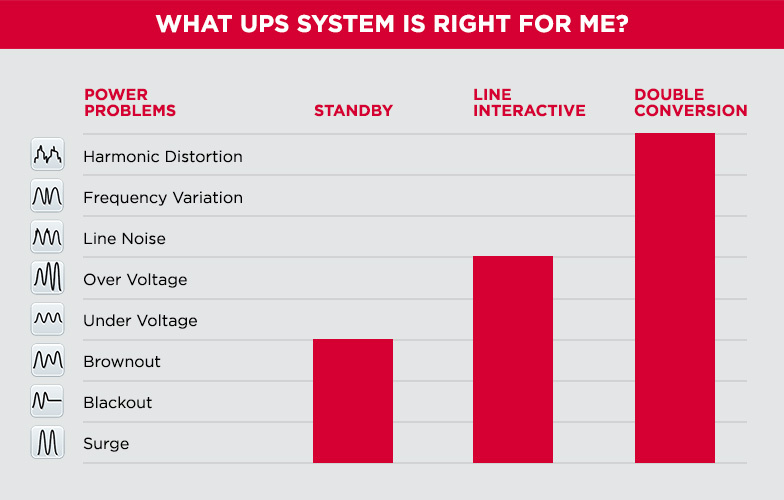 UPS systems that deliver sine wave output prevent unexpected shutdowns and damaging electronic stress. If you need help determining whether a device uses Active PFC circuits, contact the device manufacturer. What do I want my UPS to look like? When choosing the form factor, the main consideration is where you are going to use it. A desktop or compact UPS can hide under a desk, unnoticed. A tower or mini-tower will have a pleasant aesthetic design making it an option to sit on top of a desk or table. A rackmount UPS works well in server rooms. Where do I pick out my UPS system? Now that you have made a list of what you need in your UPS system. Visit our Battery Backup Selector to help you narrow down which of CyberPower’s UPS systems will fit your needs. If you need some guidance, feel free to contact our UPS systems experts at tech@cpsww.com or toll-free at 1 (877) 297-6937.